INGREDIENTS – 1/2 lb. of bread crumbs, 4 oz. of suet, 1/4 lb. 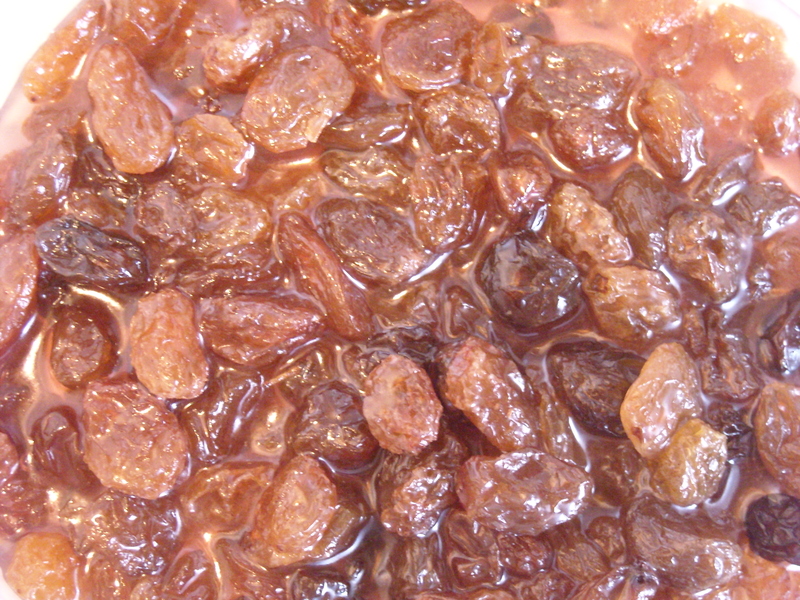 of stoned raisins, 3/4 lb. 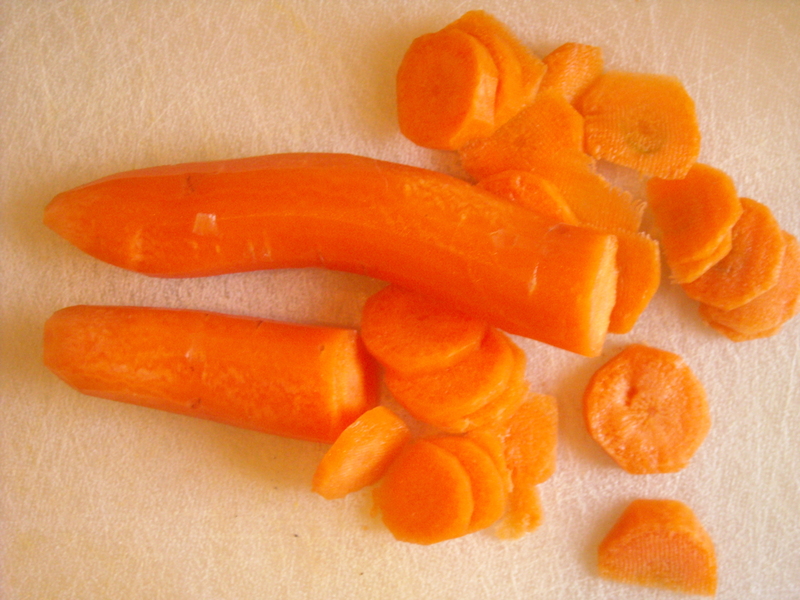 of carrot, 1/4 lb. of currants, 3 oz. 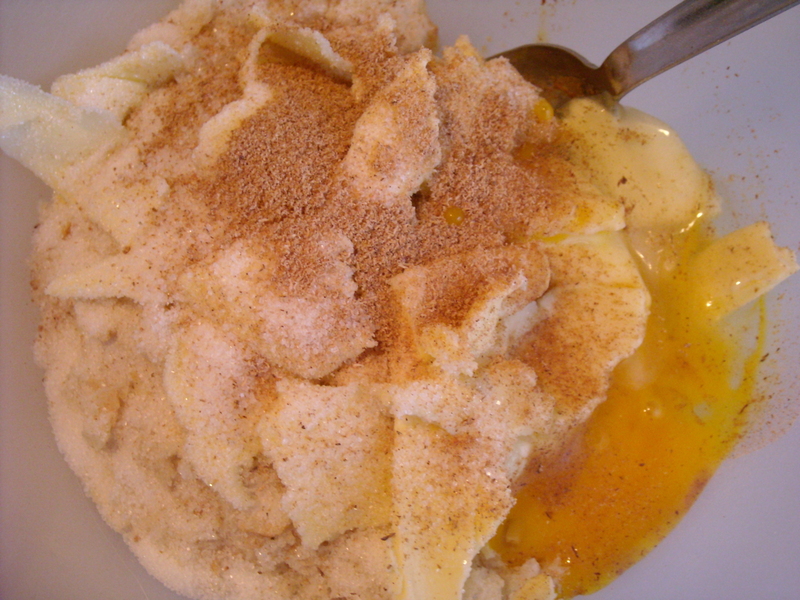 of sugar, 3 eggs, milk, 1/4 nutmeg. The first ingredient that had me hmm-ing was suet. I’m vego (my boyfriend emphatically isn’t – any attempt to persuade him otherwise would lead to the Common-Law equivalent of divorce), so the idea of using suet (which I had to research on the internet, just to be sure it was what I thought – i.e. hard animal fat) was not exactly appealing. I know there are vegetarian versions out there. I’m pretty sure they must sell both types in Germany too, where I’m currently living, but I haven’t a clue what it could be called or where to find it. 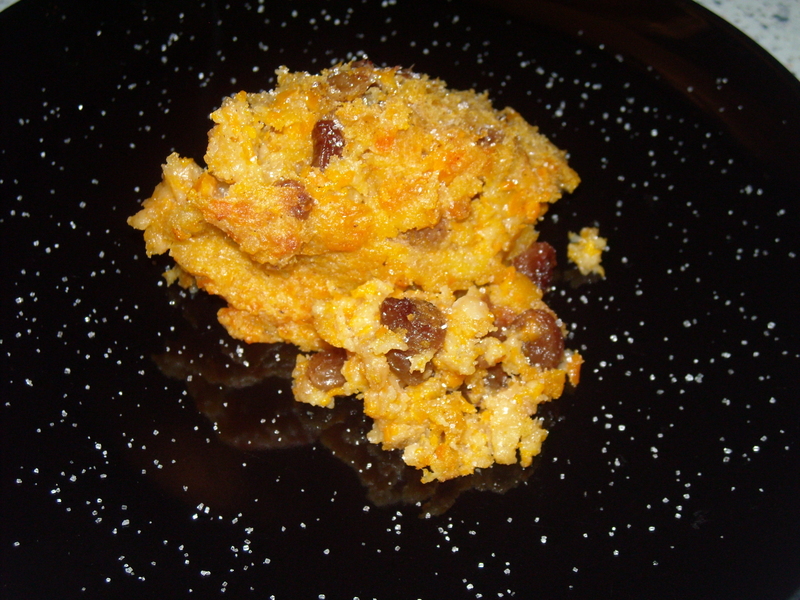 So instead, I substituted the suet for butter, reasoning that it was very much the same for the purpose of making a pudding and a whole lot better for my peace of mind. 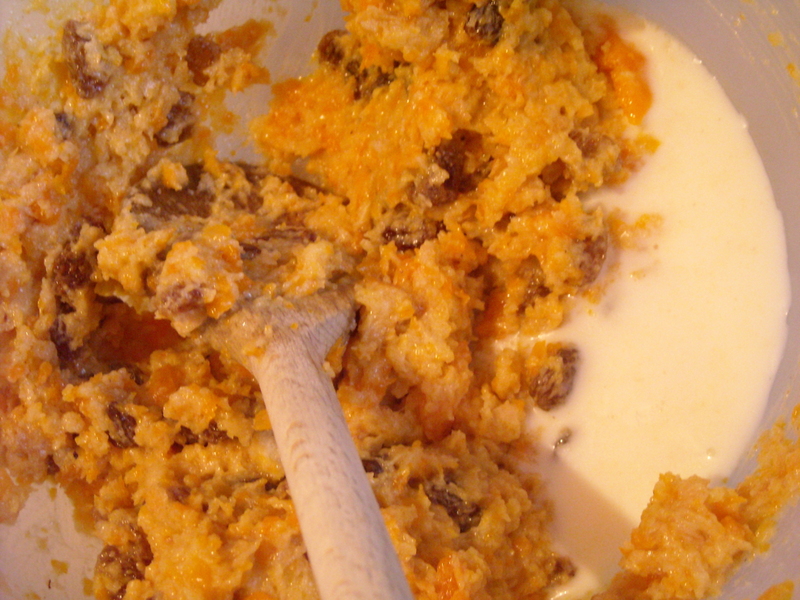 I didn’t have any currants – but I ingeniously (or so I felt) soaked a double-portion of dried raisins in some fruit drinking syrup and left them to plumpen for 30 minutes. Not being very familiar with boiling anything pudding-ish other than the Christmas variety, I decided to bake the pudding instead. Household Management doesn’t state how hot the oven should be, but I opted for 190 degrees Celsius for 45 minutes. “Would have been better with ice-cream,” mumbled my boyfriend helpfully as he, despite the lack of ice-cream, cleared his plate in 2 seconds flat. There was enough left over for us to have it for pudding the next day too, which he again managed to hoover up promptly enough to beat his 2-second record. Our eldest cat got her paws on a piece – even she approved (but then again, she pretty much eats anything – recently, she leapt onto the table and slyly polished off some asparagus and Hollandaise sauce before we had a chance to react!). 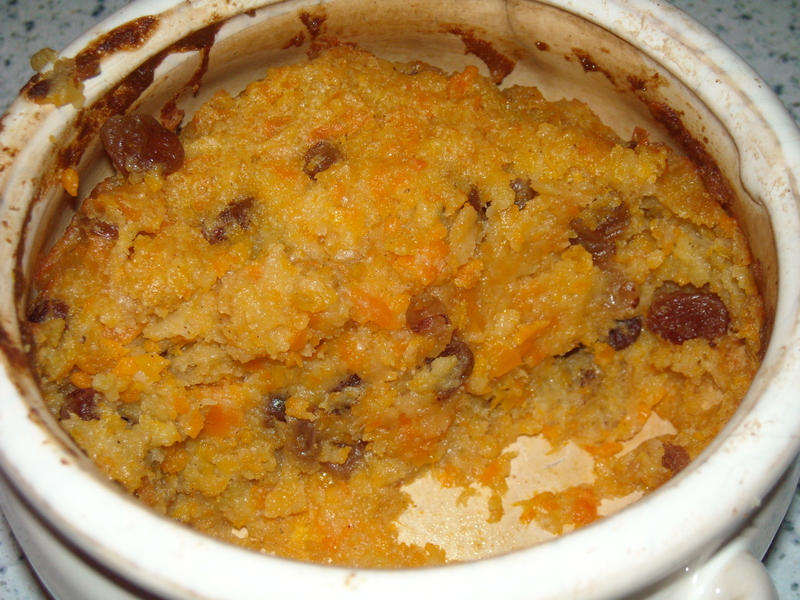 This is a nice, easy pudding – I can see myself making this again in the near future. This entry was posted on May 13, 2010 at 7:59 am and is filed under food. You can follow any responses to this entry through the RSS 2.0 feed. You can leave a response, or trackback from your own site.